On the first of October, 2017, a small group of members of Asexuals of the Mid-Atlantic sat down to discuss how they were going to begin approaching their goals of spreading awareness of the asexual identity and become a greater presence in the LGBTQ+ events that take place in Washington D.C. 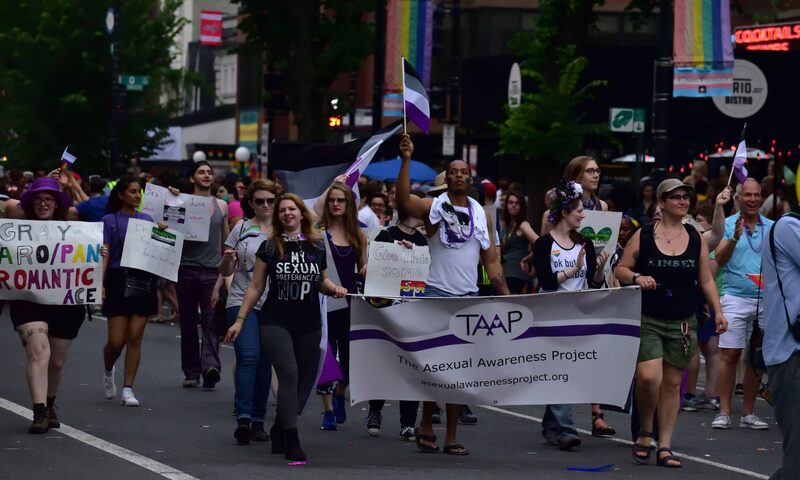 Previously that year, Asexuals of the Mid-Atlantic hosted two events to view the Capital Pride Parade and attend the Capital Pride Festival with other asexual people. Were it not for the presence of fellow Asexuals of the Mid-Atlantic, it would have been a lonely experience. Nowhere in the parade was there any reference to asexuality, which was less representation than the 2016 parade, where there was one lone ace flag. While exploring the festival, there was only one table that had an ace flag, but we ran into quite a few asexual people who were happy to see a group of other asexuals walking around. We realized that if we wanted to be represented in the parade, we would need to represent ourselves. The only problem: the parade would cost money. So we committed to finding a way to fundraise so Asexuals of the Mid-Atlantic could march in the parade, but decided to wait until the fall to begin organizing. The National LGBTQ Task Force sponsors and organizes the Creating Change. Creating Change 2018 is the 30th anniversary of the conference. The Creating Change Conference is the foremost political, leadership and skills-building conference for the LGBTQ social justice movement. Since 1988, Creating Change has created opportunities for many thousands of committed people to develop and hone their skills, celebrate victories, build community, and to be inspired by visionaries of our LGBTQ movement and allied movements for justice and equality. After many email chains, it became clear that we needed to organize formally in order to achieve our goals of marching in the parade and creating an asexual presence at the conference. We decided to form a separate group from Asexuals of the Mid-Atlantic that is entirely dedicated to asexual activism. Thus, The Asexual Awareness Project was born.